What does branding mean? What comes to mind when you hear Adidas, Channel or IBM? The images, personal experiences or thoughts you associate with each of these names is what makes up their brand. A brand is actually the logo, message, design or character of your product or service. If done well it will differentiate your business from competitors in the market, yet reflect the feel of the overall market you operate in. For instance a food brand would be very different in look and feel to a wedding stylist brand. The colours used would differ as would the strengths of the icons. It is important to stand out from your competitors but stay in your industry model so as not to confuse your potential clients. Business Branding is vital to the business success. Your logo and other marketing materials can have a great impact on your company’s success. Branding your business professionally helps you stand out and adds credibility and trust. It tells prospects that you are a professional company who pays attention to detail and invests in your brand and your business. An attractive brand identity, consisting of logo, brochures, graphics, and other business materials can leave a lasting impression on clients. 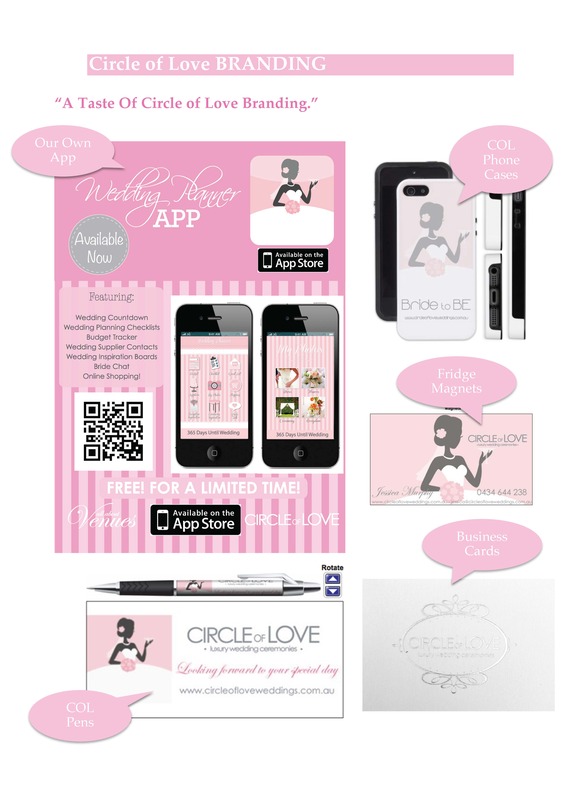 At Circle of Love we have a strong brand name not only through our logo, website, brochures, business cards, graphics but also outside the box with a ‘Wedding Planner App’, unique designer lip glosses, mobile phone cases plus more. This entry was posted in About Circle of Love Franchise and tagged australia franchise, australia franchise oppurtunities, australia franchises, business for sale, business for sale adelaide, business for sale albury, business for sale Ballina, business for sale brisbane, business for sale cairns, business for sale canberra, business for sale central coast, business for sale coffs harbour, businesses for sale, businesses for sale brisbane, franchise for sale, franchise for sale canberra, franchise for sale ipswich, wedding planner course brisbane on December 4, 2013 by admin.